Meeting minutes are notes that are recorded during a meeting. They highlight the key issues that are discussed, motions proposed or voted on, and activities to be undertaken. 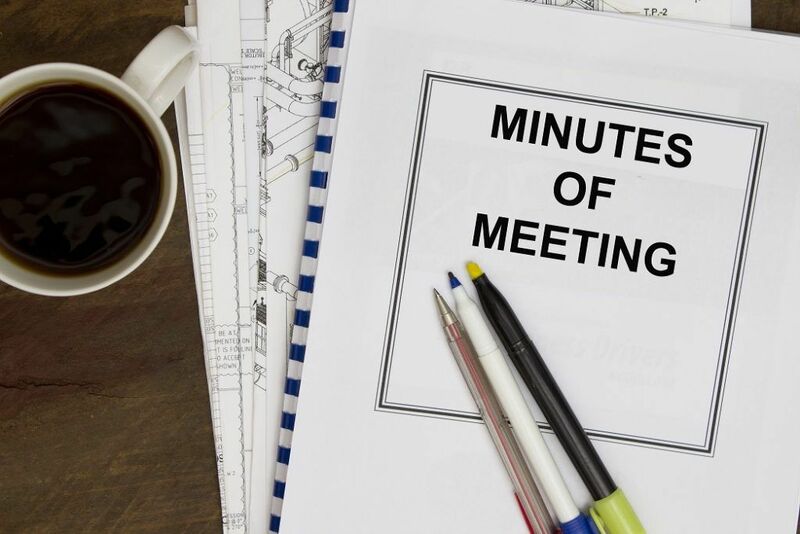 The minutes of the meeting are usually taken by a designated member of the group, and they provide an accurate record of what transpired during the meeting. If a meeting is well-planned in advance, taking minutes will be a lot easier. That said, the chairpersonCEOA CEO, short for Chief Executive Officer, is the highest-ranking individual in a company or organization. The CEO is responsible for the overall success of an organization and for making top-level managerial decisions. Read a job description and the secretary or minutes-recorder should work together to determine the agenda of the meeting beforehand. 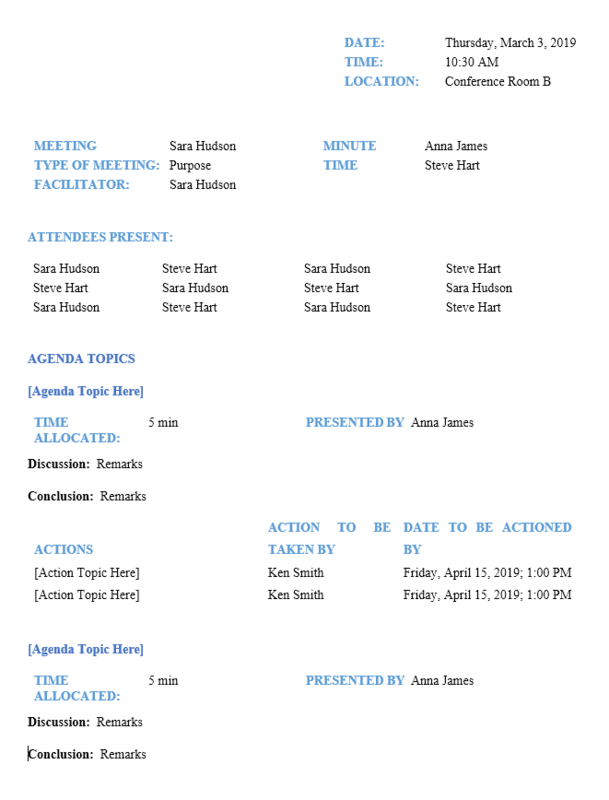 For example, the person recording meetings could work with the chair to draft a document, which serves as an agenda and a format for the minutes. When an individual is chosen as the minutes-recorder, it’s important to find out what is expected of him. Therefore, he should approach the chair of the committee and ask what his role in the meeting will be. For example, if the meeting will involve proposing motionsProxy VoteA Proxy Vote is a delegation of voting authority to a representative on behalf of the original vote-holder. The party who receives the authority to vote is, the designated member should inquire whether he should include the names of those proposing motions and those seconding. Once the meeting ends, don’t take too long to write the minutes. This way, everything that took place in the meeting is still fresh in the mind. Review the outline that had been created earlier and make adjustments where necessary. It might include adding extra information or clarifying some of the issues raised. Also, check to see that all verdicts, activities, and motions were clearly recorded. Revise the minutes and ensure they’re brief but clear. Once the secretary completes writing the minutes, he’s supposed to share them with the committee members. They can be shared online or through the cloud. Considering that minutes and other types of documents can lead to a lot of paperwork, it’s also better to use a paperless sharing approach. For example, if the minutes-recorder was documenting the minutes using Microsoft Word, which does not offer online sharing, then he should consider converting those records to PDF format and share them through email. Alternatively, one can use Google docs, which offer a way of sharing with other users. It’s not enough to share the minutes to committee members. The secretary is also supposed to save them for future references. Most companies store their minutes online – either in Google Docs or OneDrive. Meeting minutes are important as they are used to document the key issues raised during a meeting. For example, effective minutes can state the approaches that were proposed to solve a particular problem and the main reason why members choose one method over the others. The minutes of the meeting can be recorded manually or on an electronic device such as a laptop or iPad. After the meeting, the secretary reviews the minutes and makes edits where necessary. The meeting minutes are then shared with the participants. Apart from distribution, the minutes are also saved for future references. Management SkillsManagement SkillsManagement skills can be defined as certain attributes or abilities that an executive should possess in order to fulfill specific tasks in an organization. They include the capacity to perform executive duties in an organization while avoiding crisis situations and promptly solving problems when they occur.